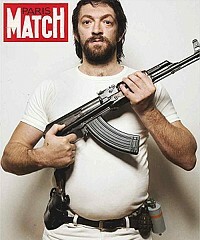 Vincent Cassel: This film took seven years to get going, so I've been with Mesrine for a while. I met his ex-girlfriends, his kids, the "work" colleagues. And I read everything he wrote and everything that was written about him, like the police reports. I've listened to the only recording we have of him - his voice. There's no video image of him, which is good, because I could invent something. Otherwise I would have to impersonate him, which is not something I'm really good at. The two films trace an outrageous series of events. Did all of that really happen? All the facts are real. We had to arrange it, and sometimes compress four characters into one. Sometimes we had to get rid of a digression, such as when he went to America and was accused of murder and got into a trial and he could prove - you know, it goes on. But you can't tell everything. For example, he worked for the government as a mercenary. They sent him to Spain to rob the ambassador's house, and he got caught! It never ends. We couldn't do everything. Was it difficult putting on the extra weight for the role? In France, people know Mesrine at the end of his life when he was using the media to promote himself, so the image people know is Mesrine when he's fat, with long hair and a moustache. So I guess if you're doing two movies - four hours about this guy - you have you give people what they're waiting for, at least the form of the body. So because I cannot gain weight while I'm stressing out, like most of us, I could not gain weight working. So we had to start at the end and finish with the war in Algeria when he's 25 years old. So four months before the shooting I just stayed home and pigged out - ate and drank. Was it fun wearing all of the disguises? On paper it looked like a dream part, but then there's a lot of practical danger acting-wise. I remember seeing a movie that I really liked with Gary Oldman - Bram Stoker's Dracula - and I was amazed because I didn't know who he was at first, and after the movie I still didn't know who he was. If you disguise yourself too much then people won't recognise you, and they can't follow the storyline because they can't attach to you. So the whole idea was that there were two different types of changes in Mesrine - the fact that he gets older and the fact that he's in disguise all the time. And we had to keep things so that the audience could buy that the people in the street don't recognise him, but the audience can recognise him. So it was part of the trick. Is he regarded in France as a ruthless killer or a folk hero? He's been accused of six murders, although he accused himself of 43 murders in the book he wrote while he was in jail. Still today not one of those murders has been proven, so we don't even know if he killed anybody. But still, he was shot in the street by I don't remember how many bullets in front of everybody! And that's interesting, because they didn't kill a murderer; they killed a clown who was getting too loud. In 1979 he was the favourite celebrity of the French people! All the police were running after him, but nobody could find him. And still he managed to give a cover story for Paris Match insulting and threatening the government. They just couldn't afford it anymore; they had to stop him and make a statement by exposing his body on TV. A lot of people were scared of him. He was a really loud person and he said horrible stuff, especially to the bourgeois people. So for them when he was killed it was a relief. And then another part of society, the poor people, were sad because they lost their icon. He managed to create the image of himself as a Robin Hood, except that he never gave anything back to the poor! How did you feel about him after playing him? I don't know honestly. I like him because I spent so much time with him, but on many occasions I would turn back to the director and say, "This is impossible, you can't defend the guy!" Strangely enough we really made an effort not to glamorise him, by showing every aspect of his personality. But a lot of people think it's sympathetic at the end. Which is just like real life: people knew what he did and they still thought he was a sympathetic character. I don't think he was sympathetic; I wouldn't like him as a friend, for example. Did playing him change you at all? I want to believe that it didn't, but then if you talk to the people who live with me, I'm sure they wouldn't say the same thing. I'm trying to de-dramatise what we do while we shoot, but it's true that I dream about it at night, so it must be important in some way. I'm trying to stay as normal as I can really, except that I was 40 kilos heavier and I was carrying a gun! And when the movie was over I was really happy to be free again, and to be able to eat whatever I wanted to, to shave my hair and go really far away to a foreign country to breathe. And the next movie I did was in Brazil on a beach. How was working with Gerard Depardieu? It's a dream! I always wanted to work with Gerard Depardieu, except that every time they asked me to do a movie with him it was a bad script or a bad occasion to work with him. So I always said no, and it was tough for me to say no because I wanted to share something with him. So this was great. The first day on set with Gerard Depardieu you fall in love, the second day you hate him, then the third day you fall in love with him forever. I feel really close to him on many levels, but I won't make the same choices that he did. And that's something I've learned from him - thanks Gerard! He makes too many movies - too many bad movies. He's such a great actor, but he cannot stay without work. I can. You don't have to do everything that comes along anymore. I can be choosy and, plus, I don't want to work all the time. I come from an acting family, so I saw my father making errors and I learned a lot from him, more than anybody else. So that's the good thing about coming from a show business family: there are a lot of things you understand before experiencing them. For example, the choice aspect has always been very present for me. The first time I worked with older directors was last year when my father died, strangely enough, and I worked with Jean-Jacques Annaud and David Cronenberg. Before that I always worked with young directors, because for me it was the only way to find my own identity as an actor and as a person.